Trevose, PA – Lenox Instrument Company‘s Furnace Camera HD provides glass manufacturers clear, high-resolution images of process conditions inside glass melting furnaces. Furnace Camera HD Systems are used to safely view and optimize burner flame geometry, monitor material mix, batch pile, formation patterns, melting point, bubbler operation, molten glass surface and refractory wear/condition. The Furnace Camera’s stainless steel camera housing mounts in a 3.5 inch (89 mm) opening and employs a steel triple wall laminar flow for efficient water-cooled protection of the CCD color camera and the latest optical lens technology with integral air-purging, enabling operation in hostile environments up to 4250°F (2345°C). Models are available in 24 inch (61 cm), 31 inch (79 cm), 36 inch (92 cm) and 42 inch (107 cm) lengths. Lenox, high-temperature, Furnace Camera HD Systems are supplied with a NEMA 4 (IP66) junction/interface box that includes camera power supply, camera adjustment interface, RS170 analog video output, and termination and temperature readout for the provided temperature sensor that monitors internal camera housing temperature during operation. Ethernet or Fiber Optic outputs are also available as options. Furnace Camera HD Systems can be configured with a variety of lens options, including zoom capability. 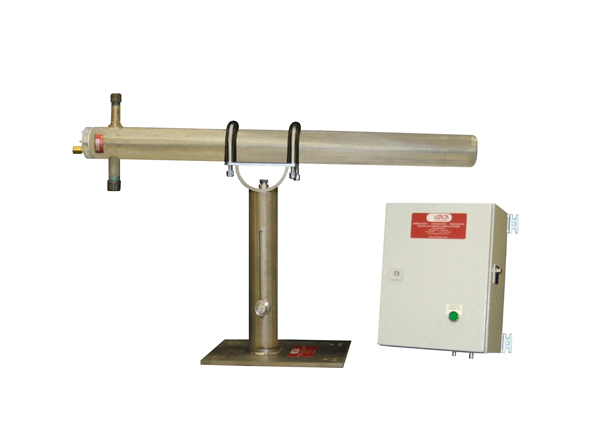 A Tilt and Telescopic Stand is available for mounting the Furnace Camera HD to the furnace. Each Lenox Furnace Camera HD System is designed and manufactured in the U.S.A., serviced in-house by Lenox Instrument, and is backed by an industry-leading two-year warranty.